Fill your kitchen with the iconic smell of baking apples and cinnamon with these cozy oatmeal baked apples. Cored apples are filled with an oat-brown sugar-cinnamon mixture and then baked until the apples are soft and the oatmeal mixture has a cake-like consistency. The moistness of the baked apples surrounds the oatmeal mixture to make a heart-warming dessert or breakfast that is full of nutrients and delicious comfort. I love all types of baked apple-cinnamon recipes, and this one is a bit different to me because the apple is stuffed with a filling inside of it instead of sliced and used as a filling. Because it’s a bit different, it makes a festive dessert or breakfast, especially served with some vanilla ice cream or drizzled with some maple syrup, or even caramel sauce. We had them for breakfast this morning straight up without any added toppings, and they were so good! I added two new cookbooks to my collection over the holidays, and I adapted this recipe from one of them–Savor by Ilona Oppenheim. I love the photos in this cookbook, and the recipes are natural, beautiful, and seasonal. I made a few changes from the recipe in the book to fit the tastes of my family–but I am so grateful for the idea and the basic framework. This is a dessert/breakfast that is easy to make and comes together quite quickly, plus you can feel good about the wholesome ingredients. The holiday season is over now, and it is time to get back to work, time for the kids to go back to school and indoor soccer, and hopefully time for me to put some positive new intentions and habits into practice in my little corner of the world. We spent a few days up in northern Michigan over the New Year, and it was so refreshing and invigorating to be up in that cold, clean air! Getting away from the routine allowed us to have some good family time when we weren’t rushed or pulled in a bunch of different directions. We played some long games of Pokémon Monopoly (thanks to my son 🙂 ), went sledding, and walked along the snowy beach. I loved all the lights in town on the dark evenings–lights in the trees, lights on the shops and restaurants, lights reflected in the water along the beach, and especially the fireworks over the lake on New Year’s Eve. This is such a good time of year for introspectionand for making home a warm and cozy place. Walking in the cold air clears the head. It is also definitely the time of year to make warm, nourishing things in the kitchen. These oatmeal baked apples hit the spot this morning. Happy New Year! I hope you all have a great weekend, and stay warm! I will be sharing this recipe over at Angie’s virtual potluck, Fiesta Friday, co-hosted this week by Quinn @ Dad What’s 4 Dinner and Monika @ Everyday Healthy Recipes. Preheat your oven to 350 degrees Fahrenheit. Line a 9 x 13 inch baking dish with parchment paper. In a medium mixing bowl, combine the oats, brown sugar, walnuts, cinnamon, baking powder, and salt. Mix well with a fork. Make sure your butter is melted. In another bowl, combine the milk, vanilla extract, egg, and melted butter. Stir well. Add the milk mixture to the bowl with the oat mixture, and stir well with a wooden spoon. 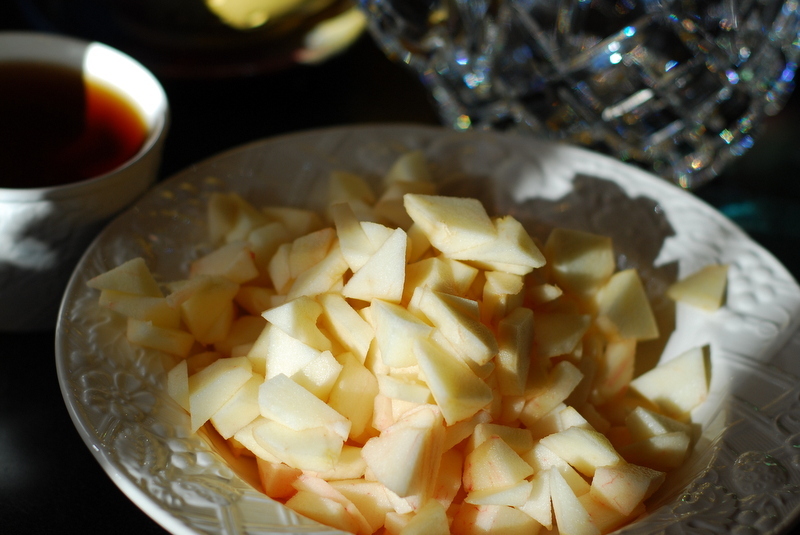 With a paring knife, cut off the tops of the apples. Set the tops aside. With the same knife, carefully cut around the core and cut out the core (you can also use an apple corer). Scoop out the seeds and rest of the core with a spoon, if necessary. Leave 1/2 inch at the bottom of the apples intact, with the holes in the core about an inch wide. Place the cored apples on the prepared baking dish. Spoon the oatmeal mixture into the cavities of the apples, filling them as full as you can. Place the tops back on the apples for baking. 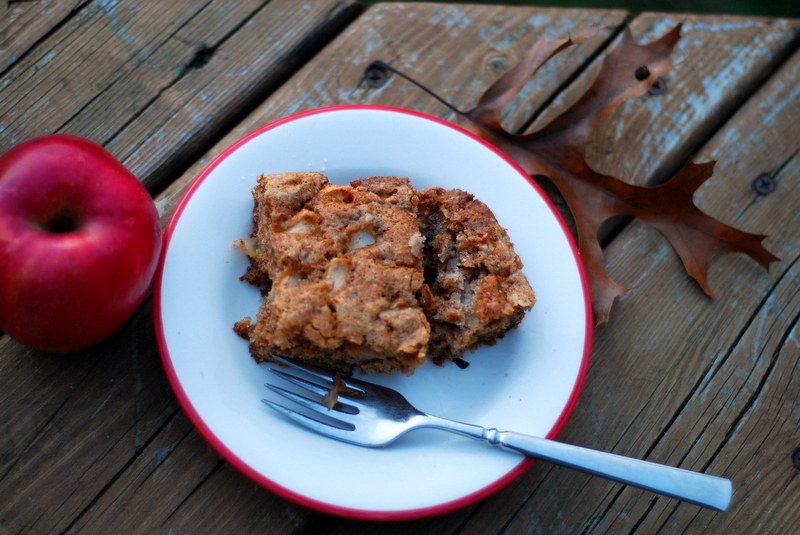 If you have oat mixture left over, you can bake it in a small baking pan and bake it alongside the apples. (I put mine in a min-loaf pan and it made a cute little cake-like loaf). Bake the stuffed apples in your 350 degree oven for about 40-50 minutes, or until the apples are soft and the oat mixture is set. These taste best warm, but can also be served at room temperature. Enjoy! Sometimes you just need a simple, satisfying dessert to make an evening more enjoyable. Sometimes you crave something sweet, but somewhat healthy. Sometimes you want something to offer your kids for a snack besides a plate of pretzels or chips. Or sometimes you want your kitchen to have that iconic scent of apples and cinnamon baking away in your oven. 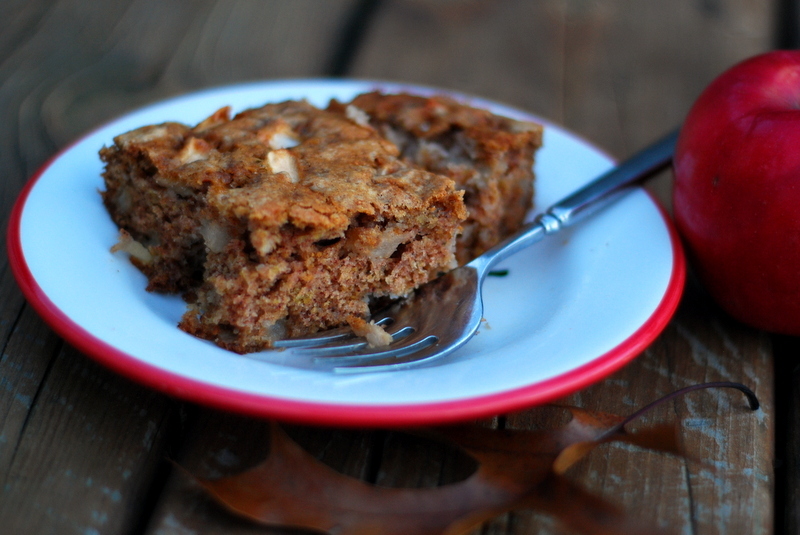 That’s when I like to make this apple spice cake. It is still making something from scratch, which is a satisfying and healthy thing to do, but it doesn’t take much thinking, and the margin for error is pretty small (unlike making a pie with a homemade pie crust, which I also really like to do, but mostly only when I have the time and energy). The most time-consuming part of this recipe is peeling and chopping the apples, but even that isn’t too bad, since the recipe calls for just about 4-5 apples (3 cups chopped). This apple cake recipe is something you can pull out in a pinch when you need a comforting dessert or snack, and don’t want to go to too much trouble. It is made up of mostly basic things I usually have on hand. The wheat germ is the only ingredient that may not be a staple for everyone, though I like to keep it on hand to add to smoothies and muffins. Wheat germ gives this apple cake a little extra heartiness and lots of health benefits, since it is full of fiber, protein, vitamins and minerals. Of course, if you have a wheat allergy, this cake is probably not for you, but otherwise, I highly recommend it as a delicious, cozy, simple dessert. Preheat oven to 350 degrees Fahrenheit. Lightly grease an 8 x 8 inch baking dish with butter. In a medium mixing bowl, cream butter and sugar until smooth. Add the eggs and vanilla, and mix well. In a separate bowl, combine the flour, baking soda, cinnamon and nutmeg. Add the flour mixture to the butter/egg mixture. Stir in the apples and wheat germ. Stir until just combined. Pour and spoon the batter into the baking dish. Bake for 40-45 minutes, or until the cake is lightly brown and a toothpick inserted in the center comes out clean. Serve with vanilla ice cream or on its own. Enjoy!